Dave Palmer: Bill, first of all, thank you for inviting us out here and letting us invade your space, as I like to say, and thanks also for providing lunch today. Bill Mertz: Thank you very much, a pleasure to be part of this. I don’t think I’ve ever seen my parking lot so full. Alright, Bill. Boy, I’m almost out of breath. So, what else do we got to say? Did I describe the location well enough because I know it’s a little confusing for some people? You said even the delivery people have a hard time getting here sometimes. Bill Mertz: Yes. We have wrecker drivers and customers just constantly calling us on the phone. They put it in their GPS, but they’re standing in front of the Hobby Lobby, which is where the GPS put them, and they don’t see where we’re at. And, for those of you Plano long timers, you might remember Hobby Lobby used to be Montgomery Wards here at the Collin Creek Mall. Directly behind their big department store, they had the automotive repair, a standalone business. So, the City of Plano decided to keep the address on 15th Street for me, but gave me a B. So, it’s 900 B, as in BOY. I guess there’s an A over there now, a C, D, E, and F because they’ve split the rest of the Hobby Lobby up — excuse me — the Montgomery Wards up to several different venues now. But, I think Dave put it best. It’s directly across the street from the front door of St. Mark’s Church. Bill Mertz: I’m very well situated being behind a Hobby Lobby and across from a Catholic Church. Dave Palmer: Yeah. You got a lot of graces flowing down on the place, don’t you? 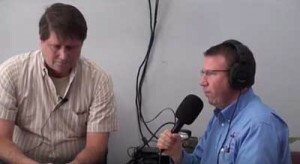 Dave Palmer: Well, you’ve been a sponsor for many years now. We appreciate you. People have heard your voice and Liz’s voice. I love the story about your wife, Liz, and what some of the kids at the school say. You can tell that story when you want to. But, first of all, tell us about getting into this business because, correct me if I’m wrong, but you were not — this is not something you’ve been doing forever and you did not originally plan to have this kind of business. You kind of fell into it in a way. But, how did that all happen that you became the shop owner? Bill Mertz: Well, it used to be a pretty long story, but I’ve told it so many times it’s kind of a short story now. But, yeah. I didn’t, as they say, grow up in the business. I’ve been in telecom all my career. I started at MCI when it used to be MCI back in 1979. Somewhere around 2000, I think there was a big layoff in the telecom quarter they call it, a real big layoff, and I was affected. I decided I needed to find another business because telecom just wasn’t hiring and I knew a little bit about cars. I knew a lot about people I thought and marketing. So, I decided to stretch my wings, and go off down that venue, and started the business. About three months after I bought it, I got a call from one of my former employers and asked me if I’d like to come back to work for them. So, I’m thinking insurance with two kids and a wife, a 401K. Gee, that sounds great. So, I packed my bags up and went back to telecom. But, I had already spent — and I did have a love in the business. I spent a lot of money on it. Well, I went out and found a very good service manager, Wayne Johnson, and he’s been very successful and helpful. So, I’m basically what they call an absentee owner. I know he’d wish I was more absent than I am, but we get along great. We’ve got a great relationship and he’s a good Christian man too. Dave Palmer: Um-hmm. Very good. Again, Bill Mertz, owner of MasterTech Auto Care in Plano, right across the street from St. Mark’s Parish. The main reason we’re here — well, a couple of reasons. We love to highlight our sponsors, and thank our sponsors, and draw people out to come visit, and meet Bill and the other staff members here. We’ve got a lot of folks who have already come by to purchase some tickets. Does Landscaping With a Sprinkler System Make Financial Sense? Your home is probably your biggest investment, and having an attractive entrance and backyard can only enhance the value. However you need to consider the maintenance and watering costs which are a monthly expense. It makes a lot of sense to improve the exterior of your home. There are several great reasons to do this, as it makes your home a nicer place to live in, improves the environment, and when you come to sell your home in the future, it has more curb appeal. Landscaping using a sprinkler system is essential in Dallas due to the summer conditions, as we will explain here. Landscaping your home is a big investment, for the best possible results, you will need to get advice from an expert. The first part of a great looking landscape design is to meet with your designer. They will visit your home and look at the existing landscaping before any design work is started. You can identify any special plants, trees or shrubs that will stay in place and be incorporated into the new design. This is also important for designing the sprinkler system for maintenance later on, as trees have different watering requirements to say flower beds. The choice of landscaping plants is important for a couple of reasons, firstly for aesthetics, the selection of flowers and shrubs is critical for the look and feel of the resulting backyard look and feel. Secondly you need to account for the climate both for the hardiness of the plants chosen, and also for the on-going maintenance and watering needed. For example, in Dallas Texas the summers are very hot and dry, so any plants and shrubs chosen should be native to the area and be drought tolerant so they watering requirements are not too great. Once the choice of plants has been made, and the layout planned out, it is important to ensure adequate watering takes place to maintain a lush green look of the plants. The most efficient and cost effective way to water your backyard is with an automatic sprinkler system. These days it is possible to design a system that delivers precise amounts of water in just the right amount to keep the vegetation looking healthy. New high tech moisture sensors can be used to measure the amount of moisture in the soil so that just the right amount of water is delivered by the sprinkler system. Gone are the days of having pools of water in your lawn, where over-watering took place, the only time that would occur would be with a sprinkler head problem, which could be fixed easily. One of the issues we are having in recent years are summer droughts. Over the last three years the city of Dallas has imposed watering restrictions on landscape watering for long periods during the summer. Fortunately most modern electronic systems can easily be re-programmed both to comply with changing city requirements, and to keep your landscaping looking great. So the secrets of having a long term beautiful landscape around your home and backyard are the choice of plants, regular maintenance and watering. By designing in the use of automatic sprinklers, you can reduce the amount of hand watering, and ensure that your landscaping continues to be a wise financial investment for the value of your home, and also a great place to relax in when you are home. When looking to raise capital for investments, one of the most popular ways for a company to do this is by selling a bond. Bonds are used extensively by the federal government to raise money, in which case they are known as treasury bonds, but that is a topic for another day. 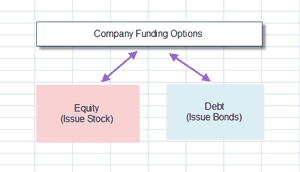 Most companies have two main options to raising money for investments, either by selling stock or bonds. Depending where a company is in its life cycle, both can be good choices. Selling stock raises capital which does not need to be paid back, but it comes at a price of diluted ownership for the owners or current stockholders, and sometimes bonds are preferable. Instead of equity, issuing debt or bonds can be a good choice when the shareholders do not want to issue more stock, and the company is generating enough cash flow to service the bond repayments. A commercial bond is a loan to a company, made by an individual, group of investors or another company. The loan brings in money to the issuing company which can then invest in additional assets, which may be new plant, materials or buildings to grow the company. Typically a bond is secured by a contract with the company which guarantees repayments on a set schedule over a period of time, which typically varies from 1 to 10 years. Issuing bonds allows a company to loan money from a wide selection of lenders and investors, who individually may have been reluctant to take on the liability of the entire loan amount of the issued bonds total. From the lender’s perspective, they do not get a return from the potential growth of the company (which may or may not happen, and may or may not be profitable), but they do get a fixed and guaranteed return on their loan, over a period of years. Many investors like bonds because the return on a quality corporate bond is pre-determined, and is relatively low risk. This is in contrast with a pure equity investment which can be high risk, with no guarantee of return. To balance out an investment portfolio, many asset managers use a mixture of stocks and bonds in a portfolio to balance out potential risk. The actual percentage of each component varies, and with individuals depends on their risk tolerance. In most cases risk aversion grows with age, and many younger investors have a high percentage of stock for the potential capital appreciation and few bonds, whereas older investors nearing retirement often have a high percentage of bonds to guarantee income. The interest on a bond is fixed, and is more dependable than a stock investment. The face value of a bond (sometimes called par value) is typically set at $1000, and the annual interest rate (sometimes called coupon) will be set at time of issue, with the maturity date (when the loan is due to be repaid) in a year or more. In practice the interest rate or coupon is typically paid semi-annually to the investors. If the coupon rate is higher than the current market interest rates available to investors, then as long as the bond is relatively low risk, then it is an attractive investment, and potential investors will be willing to pay more than face value. Alternatively if better investments re available elsewhere, then investors will not be willing to pay the full face value of the bond and it will sell at a discount. Most bonds pay an annual interest rate, but in some cases. no interest is due to the end, and these are known as zero coupon bonds.